Who knew tissue paper confetti could be so fun? Nana (my mother) and Hensley Grace (my niece) enjoy the excitement! I think this picture of Granny and Hensley is so sweet. Hensley is named after this set of grandparents. Their last name is Hensley. I had to show you my plate because my mom and granny worked so hard to make sure that they prepared a meal that I could eat. And, it was yummy! 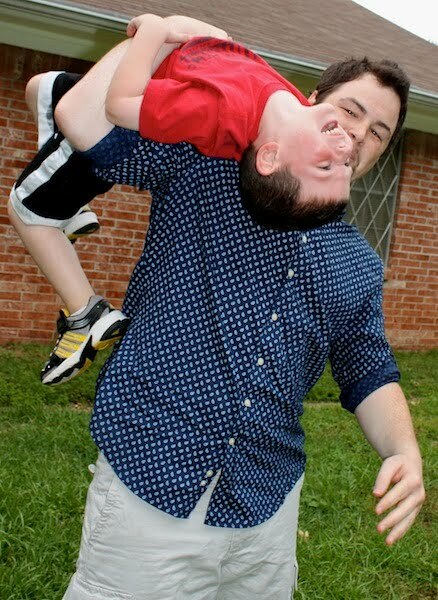 Maddox and Uncle Brian wrestle in the yard. I guess this type of play never gets old. You can barely see it, but I was trying to show the flower that Maddox picked for my hair. He's a sweet child, even though his tongue out my indicate otherwise. You know, I was thinking about something while I was in the shower a few minutes ago. I do my best thinking in there! The Lord is so wonderful to prepare us for the seasons which we will inevitably enter. For my entire life, I was a baby fanatic. I loved everything about babies, including all of their stuff. In fact, for my 5th birthday, I wanted a real baby stroller, not one of those cheesy little kid ones. I wanted the real deal, so that's what I got. When I was in preschool, we had this little baby Cabbage Patch doll named Cleo Heddie. We could check her out and take her home on the weekends. I took her home so often that my grandparents still talk about her by name. When we went to Wal-Mart during my childhood years, we were often allowed to get a small toy. Every single time, I got the same little newborn-looking baby doll. Of course, each one had on different clothing, but I had five or six of these little dolls, in addition to a whole swarm of other baby dolls. I never played with Barbies, only babies. And, I had diaper bags, pacifiers, bottles, blankets, clothing, etc for these little things. Babies were my passion! For years, I always thought that I was cut out to be a mom. I just knew that was my calling. After all, I'd been oooing and aaahing over babies from the time I was a baby myself. I babysat many years before I could even drive, and I've worked with children my entire life. But then, things changed. Babies and children no longer held the same appeal for me that they used to. Sure, I still found them cute and cuddly, but only from a distance. All of a sudden, I didn't seem to have much interest in any of their gear, and I certainly didn't care whether or not I held other people's babies. I just lost interest. Certainly, I still adored my niece and nephew, but I didn't seem to yearn for babies of my own. Then, I found out that babies of my own were not going to be a physical possibility for me, all because of cancer. What would've devastated me only a few years prior, was now okay. My heart wasn't broken, and my hopes and dreams weren't dashed. You see, the Lord prepared me. He changed my heart, and molded my desire to match His will. At the time, it didn't make sense for me to be so unenthused by having babies, but now it does. For those mommies out there, please don't misunderstand my point. I think that motherhood is the highest calling. It is full of sacrifice and love, and I admire what each of you is doing with your life. And, who knows, I might be doing the same thing one day. But for now, the Lord has removed motherhood from my desires. My point is simply that we can trust God. We can trust that He is good in all things. We can trust that He knows. We can trust that He has our best interests at heart. We can trust that He is holding and shaping our dreams. Isn't that incredible? Your celebration with the family looks like a wonderful time. Hensley is certainly a charmer. I love that she has a name with significance. Both of our daughters have special reasons for parts of their names. You really got me when you shared your thoughts on not being a mother. I am blown away, again, that God has so carefully orchestrated all the details of your life to bring you where you are today. And, to think, that we waffle in our trust sometimes and stew and worry about things. Praying for you. I think God is protecting your heart. Maybe one day when you're through with all this crazy treatment you'll have the desire to adopt, but maybe you won't. Either way that's okay. When my son was born I had a lot of complications, and I found out that it would be very risky to have more children. I had always wanted at least three, but now I'm very content with just one. We've talked about adopting, but that would be way in the future, and the truth is I've learned to be happy where I am. While I'm certainly not comparing what happened to me to your illness, I do understand how God changes our hearts and our desires when we let him. I am a mom and take NO offense at your comments!I was not itno babies and didn't want kids until my son made a surprising and unplanned entrance! Turns out God knows what we want better than we do (who knew this fact!) and gives us the true desires of our hearts. If Paul can be content with just God while in prison, than perhaps we can learn to be content with what God has handed us. P.S. When you are out for the summer and get some extra time, I'd love to see some of your best recipes for your new diet. Souds so delicious and healthy! Prevention is key, right? God is giving you amazing insights. It is His grace that prepares us for what is ahead, even though we may not understand it at the time. It's beyond incredible, yes it is! Well said, God certainly has a way of preparing hearts. The photos of you and your family are great! Thanks for sharing. I think your positive outlook is amazingly inspirational!